In this lesson, you will learn how to create your dashboard using the Dashboard Designer. First, open the Dashboard Designer. The first steps into creating a dashboard and opening a Dashboard Designer you will find in the topic Create a new dashboard. You can use InLoox PM Database or connect to another one. The InLoox PM data source is on the left site panel of the window. You can choose between different data sources as Project, Work Packages, Planning, Time Tracking, Budget and Budget Position from the drop-down list. Learn how to create a new data source, see Creating a data source. Create Dashboard Items and Bind them to Data. 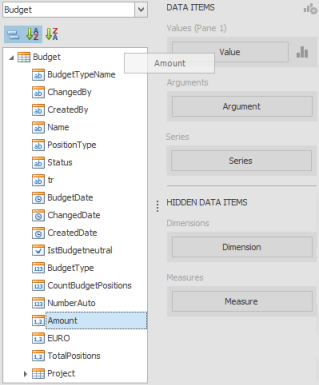 Learn by example how to create a Comparison of budget types dashboard view. The description of the dashboard items you can find here Creating dashboard items. To learn how to bind required data, see Binding dashboard items to data. Click the wanted dashboard item on the Ribbon, e.g. Chart. Drag the Amount field to the Values placeholder in the Values section. Then place the Name and Number fields (for projects) in the Arguments section. After drag the Name field (for budget types) in the Series section. Click Save and Close on the Ribbon. The dashboard view Comparison of budget types is now ready. First steps when creating a new custom dashboard | InLoox PM 8 • Copyright 1999-2019 © InLoox, Inc. All rights reserved.